The rush to make a graphic point by mistakenly overlaying concentric circles atop a Web Mercator projection helps to render increasing fears of the range of North Korea’s powerful ballistic missiles. As much as suggest the global import of the confrontation about North Korean missiles through their violent potential to target overseas lands, the effect is to abstract the peculiar stand-ff of a divided country that is a remnant disfigured by the Cold War as if it can be isolated from the division of the peninsula, and viewed as a focus of global attention. But is the isolation of North Korea that they effectively underscore in such cartographically dramatic terms also not a cause for concern? How can the intentions of the opaque government of Pyongyang even be understood save in a close focus on the local dynamics of the Korean peninsula? If North Korea is increasingly effectively a proxy of China–cast as an enabler of the North Korean state, together with Russia–the country is shown, isolated, as if the Democratic Peoples’ Republic of Korea, DPRK, were the last remaining theater for conducting the cold war in a post-Cold War world. A familiar geography of generals suddenly migrated to the media as the confrontation with North Korea was begun to be processed in maps. The current migration of this mapping of a global vision of generals to the media presents a problem of the survival of a mental imaginary, able to compromise the pragmatics of a real problem of international relations in dangerous ways. For by magnifying the isolation and marginality of the DPRK in relation to the globe, the maps urge us to focus on the risks that the development of intercontinental missiles pose to world peace. To be sure, they also risk reflecting the very barbed rhetoric of triumphalism and destruction of Pyongyang–a regime that has expressed its eagerness to deliver prophesies of “a merciless sledgehammer blow to U.S. imperialists.” The threats of Kim Jong-un are especially embodied by the creation and possession of his country, for the first time, of Intercontinental Ballistic Missile, and seems to create a narrative less motivated by actual actors, but a drama of atomic, nuclear, or ICBM strikes that is driven by disembodied geopolitical exigencies in a political theater that we don’t know where it will end, but ramps up an all too familiar cartography of fear. These maps resurrect and resonate with the invocation of previous threats of war during the Cold War–when the fear of atomic attack was widely diffused by the U.S. Government as a basis to justify an arms race. Indeed, by rehabilitating a Cold War imaginary of impending conflict able to escalate into nuclear war, maps seem to activate a similar mental imaginary of polarity–albeit disproportionate one, between North Korea and the United States–that reflect one of the few areas in the world where that rhetoric is still alive of identifying the role of the state in promoting nuclear war–leading Kim to praise the “thermonuclear weapon with super explosive power” as made entirely “”by our own efforts and technology and designed to exceed the atomic bomb dropped at Hiroshima. In this context, the fear of a “global threat” can be rehabilitated as destabilizing global balances of power. The first scenario of an attack on the United States–cast in fearful and unresolved terms–was diffused in terrifying detail shortly after the bombing of Hiroshima and Nagasaki in 1945, as if in a surge of guilt, by the emigre Hungarian graphic artist Aleksander Leydenfrost, in a bifold spread that appeared in the extremely popular Life magazine, perhaps asking readers to feel a sense of guilt at the destruction caused by dropping two powerful atomic bombs in the Pacific theater of war, that illustrated a memorandum that the commander of the Air Force in the Pacific Theater, Harold “Hap” Arnold, in a “Report to the Army” he wrote in the late summer of 1945. Arnold cautioned against the next war as an episode that would last but thirty-six hours, and for which the United States military must begin to prepare itself, if not to confront the unprecedented scale of destruction that the United States landscape–which war had of course not touched, thankfully–must now take time to prepare itself to face. And the sustained campaign of firebombing Japanese cities after the massive destruction of the second atomic bomb, Fat Man, that was roapped on the port city of Nagasaki unleashed a level of violence that had followed the instant incineration in that city alone of 70,000 had created a landscape of destruction that Leydenfrost’s somber image led Americans to imagine as inflicted on the major cities of the United States, not by the delivery of airborne bombs but the arrival of intercontinental ballistic missiles–what we now call ICBM’s–launched without pilots, akin to German V-2 rockets, but able to reach across the Atlantic, in ways that would redefine what we know as a “theater of war” in globalized terms for the first time. The nightmare of unmanned missiles, viewed from the empyrean heights above the Pacific, seemed to seek o terrify viewers to suggest how quickly and silently an attack could arrive. The resurrection of what might be called a map designed by generals such as Harold “Hap” Arnold filled a new need to map the power of destruction that the atom bomb unleashed, and represented both a sort of spin as well as a notion of the stewardship of public debate. Arnold wrote in a context where seemingly responsible “scientific men” were entrusted by the US government to explain to the public the scope of the horrific new power that the atomic bomb unleashed, and to rationalize the devastation of the total destruction of a city destroyed to devastating effects unprecedented in their violence as a decision of the nation, men like James Conant or Vannevar Bush, trusted to create consensus about the use of atomic bombs and the pragmatic basis for atomic policy in a postwar world, at the same time as the popular press quickly predicted the conduct of future wars which minimized all human agency, and perhaps responsibility, by pilotless “robot planes” able to span transoceanic distances and increase the vulnerability of all American cities and industry in the very manner of Japan from a “hail of atomic charges” in 1945. Leydenfrost’s image, designed for a public announcement of Arnold’s letter, captured this anxiety. It reveals, in a futuristic manner akin to H.G. Wells or recent science fiction, how close to the surface it was as an image of future destruction, able to be harnessed for clear ends as a narrative of imminent fear, even if one that lacked any clear narrative finality as a story which we could ever see as having clear winners. The “revolution in warfare” Conant detected after the destruction of Hiroshima and obliteration of many of the buildings of Nagasaki brought strategies of management of threats in a new global imaginary. Conant quickly acknowledged that there was no real possibility of defense against such a “surprise attack by atomic bombs,” as he dryly put it. Yet the government tried to reorient attention to the immediate problem of survival of the fearful eventuality of an atomic attack. “We are living in a very different world since the explosion of the A-bomb,” Conant began, addressing the problem of what could be done in the event “much of our present civilization” was threatened with extinction. Conant pondered with incredible detachment pondered how “much of our present civilization” was threatened after Hiroshima and Nagasaki, nd to contemplate ways to save the achievements of the United States against such imminent destruction by buried repositories of microfilm,–as if such a parallel responsibility were adequate to the development of the atom bomb. In contrast, Arnold’s “Report to the Army” emphasized the need of responding to a remote atomic strike in ways that created an image of vulnerability to missile strikes that quickly burned into our collective unconscious. Its inheritance might well be reexamined in the light of the fears of global threat of strike from North Korea that has emerged in the very first months of the Presidential administration of Donald J. Trump. The power of the ICBM warheads that North Korea has developed have, rather eerily, just achieved the level of power of the atom bomb dropped on Hiroshima, enabling exactly the sort of scenario Aleksander Leydenfrost, no doubt with editorial help, was able to so concretely map from a position over the Pacific, which oddly renders North America as an island-like target, as if it could echoe the many flights of United States bombers over Japan. These unmanned rockets, shot from an unspecified country in Africa where the rocket launchers of a nemesis were placed, described the phantasm of the or mental image of the next stage in warfare, rather than an actual map. But the concreteness of the map allowed readers to envision the proximity of a potential strike in particularly powerful ways. And they have been triggered again in the azimuthal equidistant projections that project North Korea at their center, and map the ability of powerful missiles to strike the more populated cities of the United States. 1. Although graphics that render the potentiality of newly powerful missiles developed by Pyongyang work to grab viewers’ attention, they draw attention to the danger of North Korea as if from a general’s point of view. The rush to map the striking range of North Korean missiles, as in the header to this post, often were created by overlays so quickly to perpetuate a sense of a flat earth–particularly embarrassing in an age of web-based maps and spatial tracking. The egregious mis-mapping of a nuclear threat occasioned a volley of objections to the distortions of maps that foreground their danger, and the innocent position of many who are endangered by their missiles, while mismapping their true range. In order to come to terms with the global import of Korea’s generation of ballistic missiles’ of ever greater striking range, web Mercator may irresponsibly effectively shrink the distances missiles travel, with geopolitical consequences, but the mapping of the range of missiles privileges a narrative of overweening nuclear ambitions and aggressive acts that runs the risk of magnifying the military threat posed by Pyongyang, and giving an opportunity for Kim Jong-un to magnify his own sense of grandiosity on a global stage, even in ways that seek to justify the need for a pre-emptive military strike against a North Korean threat. The focus on the hypothetical expansion of missile range and the eagerness to trumpet the new status of North Korean military as able to launch an intercontinental ballistic missile and nuclear strike–long desired by Pyongyang as a sort of metric of global respectability and renown–is a danger but one that repeated exaggerated mipmapping can only magnify. For in suggesting the blameless nature of other nations before this threat, they direct focus on the aberrant nature of North Korea and its leaders as needing to be contained, and many indeed justify the importance of a “preventive” pre-emptive nuclear strike. The maps open a possibility of alternative narratives, some particularly deadly and undesirable in the extreme, of an immediate launch of warheads not only at American military stationed in South Korea, Japan (especially in Okinawa) or Guam but at the United States as as never before. Indeed, the public statements and postures that Kim Jong-un is “begging for war” seems to map the need for a nuclear confrontation, filled with the frustrated saber-rattling that while “war is never something the United States wants” the “outrageous” testing of a hydrogen bomb only tests its “limited” patience, as North Korea vows its ability to perform a “surprise launch of an ICBM in any place and region at any time,” seeking to prove that “the whole US mainland is within the firing range of DPRK missiles,” as the national news agency KCNA has affirmed. The recent explosion of a bomb with the explosive power of the atomic bomb dropped on Hiroshima by North Korea on the eve its independence celebration provides an illustration of Kim Jong-un’s leadership, even if it is doubted that what seems a thermonuclear device would be able to be attached to a ballistic missile with any reliability. But the expansion of maps of intercontinental range in the global press seems to magnify the threat of immanent attack or aggression from North Korea, as if in a presence to justify what would be an utterly irresponsible decision to launch a military exercise of any limited sort. All too widely reproduced images of the growing range of North Korean missile strikes create an all too real cartography of fear that seem to escalate the danger of a threat and the need for an aggressive military response. As the actions of Pyongyang have been repeatedly cast as a “global threat” by the Trump administration, from Steven Miller to Rex Tillerson, provoking not so veiled threats of the need to respond with a “precision strike” missiles into nearby waters off the east coast of the peninsula or to strike at the missile test sites, maps of the n this game shifting estimates of the outermost reaches of NK missile strikes by the Democratic People’s Republic of North Korea have provided something of a basis to reveal exactly what the states of that provocation would be and proof of the global threat that North Korea’s missile pose over the unsuspecting and innocent inhabitants of multiple continents. 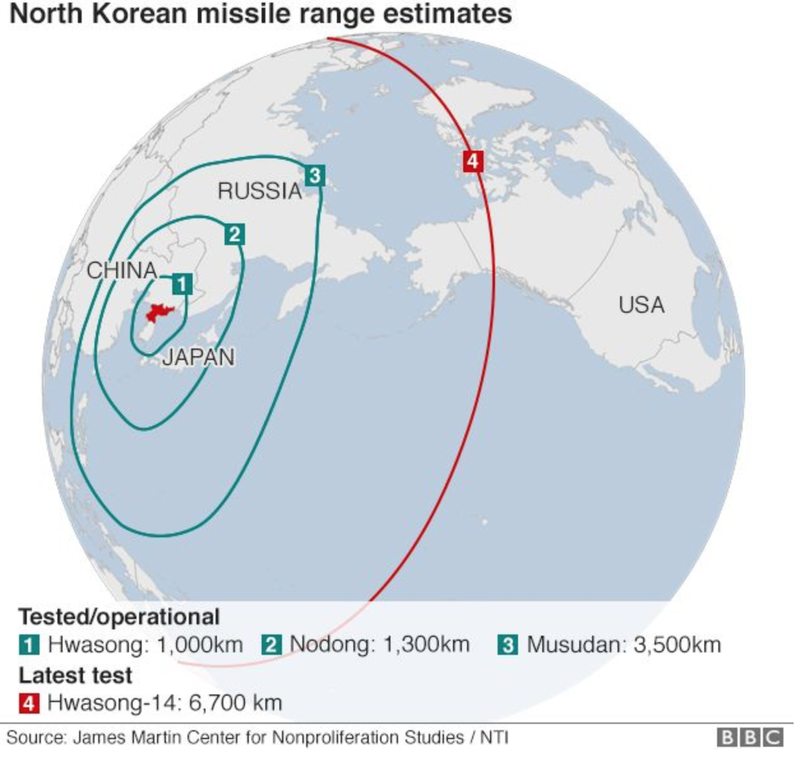 Although the outermost reach of the radius of missile firing is openly acknowledged in the BBC graphic below to be not operational, the claims to have created an ICBM able of intercontinental strikes would place North Korean arms far closer to the United States citizens–as well as to United sates troops stationed in South Korea or Guam–in ways that have been a long aspiration of North Korean governments. The new justifications of nuclear attack in the aftermath of the apparent explosion of a hydrogen bomb by Pyongyang–and the unrestrained bullying of the North Koreans that “they only understand one thing!”–have pushed the problem of military confrontation to the front pages, with Trump warning of the possibility of a “massive military response” and suggesting if not indeed mapping a targeted nuclear strike of North Korea’s nuclear and missiles sites, as if their destruction could occur without any harm to the world. The threat that Kim Jong-un poses is being cast as a potentially aggressive act–needing to be met with immediate and massive force–even without mapping what his intentions or strategy–as the explosion of a fusion bomb of comparable size to that dropped on Hiroshima is increasingly mapped as a potentially aggressive strike on American cities. The appearance of these charts in the global media no doubt give huge satisfaction to Kim Jong-un, whose dream of seeing his nation as a global power has been realized, as his country suddenly occupies the position of a major threat that the Soviet Union, no less, had occupied in the Cold War. Indeed, as President Trump responds to questions of his military intentions with North Korea with a shrug intended to be menacing–“We’ll see!”–in a particularly troubling lack of restraint, he seems to be inviting audiences to map the danger signs emanating from North Korea, rather than to establish the security of his own political restraint, by perpetuating myths of the aggressive nature of North Korea. As headlines such as “North Korea Raises the Stakes” have repeated since early July, if not from the first announcement of improving missile technology to complete the construction of an actual ICBM–intercontinental missile–of the sort it has long sought, as if to escape its isolated status, even as South Korea cautioned a proclivity for overstatement of achievement of re-entry technologies, the tenor of recent claims that North Korea raises the stakes may have shifted the metaphor of this test of wills from over thought moves in a game of chess to a contest of truth or dare or to a global game of Russian roulette. 2. Although the maps raise red alarms as they show long-range missiles able to strike the United States, the rush to use a tool plagued with distortions on a global scale is bound to create distortions or suggest the persistence to flat-earth thinking, rather than warp the striking range to acknowledge the spatial distortions of the earth’s surface within theMercator projection. But the readiness to map the ranges of newly tested missiles–and even missiles in development–suggest a rush to affirm a “direct threat to the United States”–as former CIA analyst Bruce Klingner puts it–that threaten to extend the missile range of missiles in development to beyond 13,000 km, which would place the entire United States within its striking range and endanger all who live in the expanded radius. In facing such often unsourced if impressive figures deriving from Japanese news outlets or South Korea, the interests of the maps that derive from such figures demand critical review; ties alleged between military contractors and agencies that create such maps not only terrify, but trigger a powerful memory theater of rapid strikes of an increasingly broad array of long-range missiles, reminiscent of a cartography of fear tracking missiles’ arrival in United States territory from the Cold War. As North Korea continues to profess commitment to a nuclear deterrent in the face of American bases in South Korea and Guam, charging “persistent moves to launch a nuclear war on the Korean peninsula,” and indeed the precareity of North Korea to American strikes, many visualizations of the growth based on fired missiles public South Korean statements provide a basis to foreground global tensions with an alleged objectivity that invest missiles’ striking range with an unprecedented of accuracy. They may lack such accuracy–despite their imminent danger–but the cartography of fear that they create surely seems to escalate their threat and the rapidity of their possible arrival–even if they may well exaggerate the likelihood of their striking range, without noting how operational even the most recent Hwasong-12 medium long-range missile is. 3. But in mapping the extent of such “striking range” to cover most–or indeed almost all–of the United States, such graphics manufacture an all too real danger by cartographic artifice alone, given the range of missile strikes a reality that they may well not be able to achieve in terms of either atmospheric re-entry or precision targeting, although this is an objection which we surely don’t want to have to test to find out. –that is abstracted from the military presence of the United States in the Korean peninsula, or indeed the political dynamics of the peninsula itself and the region, in particularly dangerous and short-sighted ways. The notions of a nuclear terror that such images accentuate–ignoring the question of whenter such missiles are perpetuate all too familiar narratives of the victimhood of those whose lives are endangered by the growing reach of bombs are particularly canny in their use of the objective rhetoric of cartography to make an unsubtle point, and suggest a sense of inevitability in the expanding ranges that North Korean missiles are able to target cities. The sense of such strikes–and the narratives of inevitability and a needed response that they trigger–have a long history, even if they are meant to describe actualities. For they have worked to help rationalize such a pre-emptive nuclear strike, as FOX experts speculated if “it may be time for a preemptive strike” if America should “risk Los Angeles,” imagining the waves of regret if a missile approaching the United States should a missile interceptors located at US bases not work in the thirty minutes before it arrives, in a landscape we have seen evoked before. It did not, in fact, take long at all from the dropping of atomic bombs on Hiroshima and Nagasaki for the General leading the American Air Force to imagine the new landscape of mutually assured destruction that defined the landscape of fear of the Cold War. Even though intercontinental ballistic missiles did not yet exist, save as imagined threats, or on the drawing board, the vision of strike from atom bombs arriving from overseas was presented an immediate fear to Americans, and enlisted as a compelling basis for justifying the expansion of the post-war military budget–and even equipping the nation with underground silos for storing and firing missiles able to respond to impending missile attacks. Within months after the destruction of Hiroshima and Nagasaki, when the ICBM’s that haunt the current global landscape–Intercontinental Ballistic Missiles–did not actually exist, save as imagined threats, the powerful images of destruction in what was assured to be a coming “Thirty-Six Hour War” begun by atomic bombs descending on the United States engraved a fearsome image of the danger of the first unprovoked first strike of the atomic age. The mapping of an atomic threat to the United States invited Americans to envision the possibility of attack. A similar spatial imaginary seems, indeed, resurgent in the nuclear standoff with North Korea, cannot help but recall the imminent arrival of those arcs of already fired atomic warheads or bombs, which smoothly move toward American cities through the night sky to target an unsuspecting population lying in bed at night, even if the projections of missile ranges of the missiles being tested by the North Korean army and their leader, Kim Jong-un, do not arc so elegantly over a landscape. The same landscape haunts both images. If the escalation of tensions between North Korea–N.K.–and the U.S. is mapped to process the threat of the increasing power of rockets carrying nuclear warheads, the maps advance threats of a nuclear strike on the United States in the header to this post that mirror those designed to instill panic and escalate defenses shortly after World War II, and are an odd throwback to the Cold War imaginary. But it seems to have reignited a Cold War imagery of threatened attacks on cities of North America, all too reminiscent of Cold War maps of missile range strikes. While it is terrifying to not know the intentions of Pyongyang, or the ever-smiling Kim Jong-un, the image of a Cold War spatial imaginary seems to mediate Donald Trump’s geopolitics, and the increased fear that Trump may not disavow a nuclear first strike, not so long ago condemned by Republicans as revealing liberal naiveté on issues of national defense–even if agreement against first-use of nuclear arms has been broad world-wide and recently won broad endorsement as a needed means of controlling nuclear weapons. It is important to note that the map of impending missile strikes far more conditioned the United States than the North Korean government’s response. But the spatial imaginary of missile threats has helped enable a rhetoric of confrontation and saber-rattling that Donald Trump has enjoyed effectively conjuring the threat of an immanent nuclear conflict more than Pyongyang, although the sense that an over-sensitive North Korea was only saber rattling may have been overestimated. The odd symbolic form used for mapping of the range of NK missiles as a target centered on Pyongyang in public media sources, however, keyed o the Nodong, Taepodong-1, Musudan, and Taepodong-2 missiles, suggests the two-fold message of such maps, even more than the maps from Graphiq, which similarly placed Alaska in rapid striking range. –which first raised eyebrows about the growing missile range in March, 2017. Despite the news that these launches raised in Japan, the expanded range of missiles able to reach Guam, and also strike North America, perhaps with the ability to target American cities–has raised fears that have led the rhetoric of the Cold War to return to justify renewing the nuclear arsenal of the United States–and a nuclear overhaul that Trump had already planned to proceed even before a review of nuclear strategy is completed, despite the risks of re-igniting a nuclear arms race, and despite the reckless nature of planning the use of nuclear weapons “beyond deterrence.” Has this threat, and the recent justification of improvements in nuclear arsenal and cruise missiles in a belief of the need for preparedness to “fight and win a limited nuclear war”–as one Senator briefed on the nuclear cruise missile explained with considerable disbelief–provoked fears in Kim Jong Un, whose own nuclear arsenal is indeed quite smaller than that of the United States? If Ronald Reagan, when briefed on a need to escalate nuclear weaponry, declared “A nuclear war cannot be won, and must never be fought,” the criticism of building nuclear air-launched cruise missiles that “if we build it, we will use it” the massive inequalities of the nuclear arsenal of the two countries–the United States maintains an arsenal of nearly 7,000, with 5,113 atomic warheads deployed in silos, bombers, and submarines, in the continental US and thousands in reserve, . Yet Trump has planned an expansion of stealth missiles with modernized nuclear warheads to air-launched cruise missiles necessary for a “limited nuclear war”–a term first floated in the Reagan presidency, in proposals to extend the nuclear arsenal beyond deterrence, in a strategy that is reflected in contracts for weapons designed for fighting nuclear war. And although the assumed irrationality of North Korea encouraged interpretation of their absence of the interest in nuclear weapons as a deterrent, as long the case, according to Joseph Cirincione of Ploughshares Fund, than as an aggressive threat, the striking ability of a missile now acknowledged as capable of intercontinental strikes beyond 6,700 km, has occasioned widespread tracing of radii from Pyongyang’s firing sites on maps, to show their range, and the rapidity of the arrival of nuclear-tipped missiles overseas–and to put them on the map, in ways that scarily mirror the celebrations in Pyongyang of the success of the missiles that have been celebrated in public parades. –evoke the specter of a war that would not be winnable, but seems in danger of remaining on the horizons in an almost inevitable manner, and with an eery similarity to the one time when nuclear war seemed close–a parallel that Trump’s cabinet members, as Sebastian Gorka, have all too creepily if awkwardly evoked to elevate Trump’s statesmanship, perhaps at the behest of a Commander-in-Chief who faced the threat of a showdown in nuclear arms while training in the fall of 1962 at the New York Military Academy, when national fears of a nuclear strike were indeed first faced down. Even scarier, the notion of a military engagement are imagined between NK and American troops stationed in South Korea, with All too often, we have begun to map the possibilities of “contained nuclear combat” in more localized wars on the Korean peninsula around Seoul and the DMZ, as military experts engage in mock-strategic considerations of military engagements on the Korean peninsula that lead to localized scenarios of combat with unprecedented immediacy. If these mock scenarios of military theaters echo the Vietnam War, we more often have mapped the threat in ways that seems to replicate a terrifying landscape of the Cold War. Although the scenario of nuclear strikes only really makes sense if North Korea will back down from a nuclear strike, showing the restraint of previous North Korean regimes, we look at such maps all the more readily to gain a sense of what may be in store: we don’t know what sort of map of engagement is in Kim Jong Un’s mind, to be sure, but it is terrifying that the sort of mental maps that mediate how Donald Trump may understand the threat in ways dangerously rooted in a Cold War imaginary of immanent struggle, magnifying the threat of a first strike far beyond scale as a possible preface to a winnable nuclear war. 4. The truly terrifying landscape of the inevitability of atomic warfare was indeed nourished in the days soon after Hiroshima in ways that haunted the national imagination. In ways that came to haunt the imagination beyond the Cold War, the landscape of nuclear attack was visualized for a large audience eager to process the destruction of the atom bomb and the threat that it posed, and later, after 1954, the fear of a clearer landscape of nuclear fallout. Long before the explosive power of nuclear weapon was with solemn certainty, after all, that US Air Force Commander Henry “Hap” Arnold may have helped map imagined strikes against the continental United States in September, 1945–long before the invention of intercontinental ballistic missiles, or ICBM’s, although they were tested by the United States Air Force within five years. Arnold elaborated the threat within his Report to the Army written at the end of the summer of 1945. 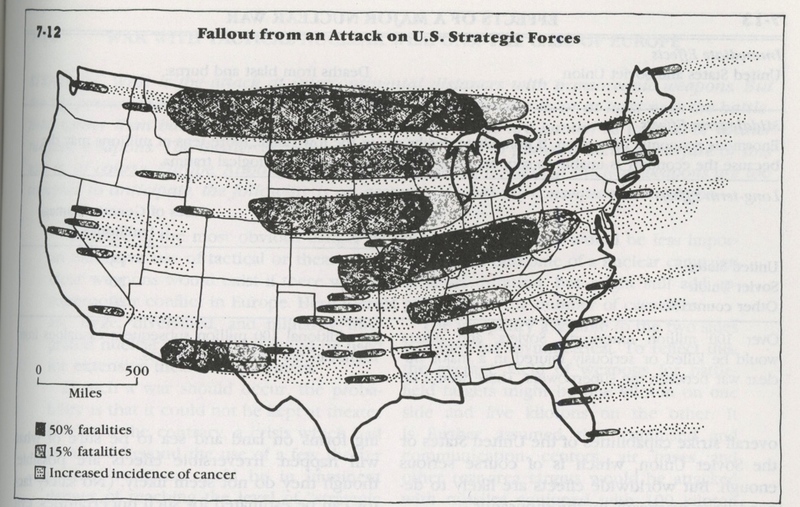 In no uncertain terms, “Hap” Arnold mapped the apocalyptic image of missile strikes, emphasizing America’s vulnerability to nuclear arms in ways that would immediately redefine the post-war geographic imaginary in the duck-and-cover era, in ways that were picked up in quite dramatic terms in a lead article for Life magazine, one of the most popular weeklies in America, which concretized the possibility of a rain of atomic bombs over the United States. Designed for the article that accompanied discussion of the report of the commander of the Pacific theater of the US Air Force most involved in the decision to drop atom bombs on Hiroshima and Nagasaki, the bifold image, here joined, created a powerful image of atomic missiles arriving over the Atlantic, from an unspecified site in Africa, viewed as if from space above the Pacific. The image prepared audiences for the disastrous consequences of the feared eventuality of an active “nuclear battlefield”–a landscape actively nourished through the Reagan years, as ICBM’s and later MIRV’s became part of the landscape of armaments that came to threatened nuclear armageddon. One can only think of the imagined landscape smeared wth nuclear fallout from targeted strikes on nuclear launch sites in the United States issued in 1954, estimated at killing half of the inhabitants in its path, publicly released just after the Bikini Atoll explosion and at an apogee of the intensity of the Cold War, which naturalize an image of the massive rates of mortality impending fear of radioactive fallout, in a map designed to ready Americans by anticipating 50% fatalities in the black smears of intense levels of radioactive fallout after a limited surgical strike. Fears of Russian missiles able to strike targets on the other side of the world in less than an hour in 1956, at the Cold War’s height, blanketed the nation with radioactive fallout became public intestimony of General James Garwin, the Army’s chief of research and development, later released publicly, to envision the deadly consequences of a strike in which nuclear weapons could be placed on the tips of intercontinental ballistic missiles. The landscape of “mutually assured destruction” has raised its head again in the images of a feared nuclear strike from North Korea–a country which claims to have sixty nuclear warheads, in contrast to the total 6,800 nuclear warheads held by the United States. But as the image that accompanied the public release of Gen. Arnold’s letter, which endorsed the need to continue spending on the military budget in a post-war period, the which In the light of a current resurgence of plans to spend “vast amounts” on its nuclear arsenal and missile defense to build up the military weapons at a cost of some $1.8 billion, and a total cost of over $1 trillion. The current plans of President Trump to expand missiles delivered from air and submarines have ended hopes for nuclear non-proliferation and arms control, but stand to profit from expanded threats and fears of an early nuclear strike in the public imagination. And if the image of the potential increase of casualties in the United States during an ear that first accepted that intercontinental missiles could each contain fourteen separate potential targeted strikes, the vulnerability that maps of a threat of North Korean missiles–if vastly smaller in their nuclear portfolio than the United States–terrifyingly seem to steel the nation about the need to confront fears of nuclear war, if not, as Robert Jacobs argued, reflect a new sense of the earth itself as the potential casualty of war. The chillingly investment of inevitability, and the inevitability of a nuclear strike, rehabilitated the most forceful rhetoric of military inevitability since the Cold War in recent times, and the first time such . And perhaps he scariest part of this mapping of impending nuclear war in these maps is the the conspicuous absence of any sense of individuals: for the maps of the ranges of bombs leave up to one’s imagination the results or impact of the nuclear strikes, creating a landscape of fear that leads to the endorsement of any possible viable strategy of response: indeed, even in “Hap” Arnold’s report, no suggestion of actual response was offered, save the possibility of sending troops over to the intensely bombed-out enemy landscape, declaring victory, and returning home to celebrate in the American cities that had been destroyed by the arrival of nuclear bombs, which the skilled illustrator of the article about Arnold’s report helped readers visualize and put their fear into visual form. 5. Or is the United States playing into the dream of North Korean leaders to be seen as a global adversary of the United States, who demands to be seen as a major actor on the world stage, and no longer confined to but one theater of military strategy on the Korean peninsula? The fear is a credible worry, for the United States seems in danger of granting new global status to Kim Jong-un, who much have taken note of the fact that candidate Trump expressed willingness to meet with the North Korean leader without hesitation, in ways that must have piqued the interest of the authoritarian leader who saw an opening for himself on the world stage–or imagined that he might direct himself to Trump as a potential interlocutor, if not use the possibility of a threat against the United States as a means to leverage his own role in the Pacific theater, where he had long been fairly marginalized in ways he found frustrating. The production of amps that focus on the new striking range of North Korean intercontinental missiles confirms his place in a new theater of global politics. The mapping of such newly emerged threats that seemed to trigger a deeply buried sort of cartographical imaginary were frequently figured as targets, perhaps concealed deeper fears of a preemptive strike on North Korea,–even as they suggested the growing range of Pyongyang’s newly developed ballistic missiles of first intermediate and then intercontinental range. British newspapers turned up the level of this cartography of fear, envisioning the possibilities for global apocalypse in all directions, analogous to a World War–predicting what the Express called World War III in no uncertain terms, with Trump unleashing nukes against North Korea and millions perishing: the missile range of North Korea was elided with a bull’s eye target on Pyongyang. The symbolic double-duty of the designation of missile range and bull’s eye target registered the greatly magnified concern from but a year earlier. If in more restrained ways, the arrival of a trio of intermediate ballistic missiles from North Korea into Japanese waters, which landed within Japan’s Exclusive Economic Zone for the first time within a 100 km of Japanese shores, raised fears of a potential surprise attack from submarines so close to the shore to reach much of western Japan, and raised questions about the abilities of the surface-to-air Patriot missile defense system stationed in the mainland. –activated increased fears of its firepower, even if we don’t know about the accuracy of its rockets to any degree. 6. The recent imaginations of the global reach of missiles from North Korea elevated the fears of such a surprise attack, to be sure, and to begin to broach questions of the long unheard-of possibilities of a reciprocal nuclear strikes–and what a strike against North Korea would look like, both in terms of its impact on Pyongyang and the spread of thermal radiation and nuclear fall-out that would affect some four million, as a strike would kill almost two and a half million North Koreans–before the Hwasong-12 and -17, whose itineraries reflect the sue of rockets obtained from third-party armaments factories in Ukraine, perhaps with assistance from countries hostile to the United States. Yet the expanded threat of North Korean missile strikes that emerged in the summer of 2017 further compelled maps of the increasingly terrifying new relation between global and local to process the deeply submerged fears. Such fears were not only activated by President Trump’s saber-rattling, but it surely didn’t help. Such threats of strikes led Americans to envision the possibility of North Korean bombs reaching San Diego, Denver, or Chicago, based on the suspected range of the Hwasong-14 and -17 intercontinental anti-ballistic missiles–as if in the perfect vehicle for propaganda for an increased military budget, one would be tempted to say, if the range expanded wasn’t so striking. Indeed, the growing striking range of ICBM’s that now seems to extend up to possibly 6,500 miles, and deeply into the shores of the United States, temporarily distracting attention from how Trump’s own presidency seems increasingly in danger of collapse. To be sure, the imaginary of a nuclear attack have long haunted our maps of America, through the 1980s, and are likely lodged in Donald Trump’s mental imaginary. But if earlier maps of FEMA rendered American targets, the creation of ballistic missile maps confirmed the fears of their arrival from a hostile country. The image of missiles arcing into national frontiers to target actual cities resonated from the Cold war. But the arcing of missiles from afar has given new concrete qualities to a map of nuclear vulnerabilities or risks. For although such maps raised specters of imminent fears, the identification of potential missiles of a country that is not a signatory to the nuclear non-proliferation accords (how did we let that slip by?) has created a sense of being able to generate maps of missile arrivals in all too provocative ways. Despite their sense of inevitability, the uncovering–and recovery–of a clear genealogy in these statements and fears of nuclear destruction seems as good a way as any of stripping these pronouncement of the odd authority of inevitability. For the genealogy of a survivable atomic attack might begin as far back as the first atomic bombs were dropped on Japan. Only months after atomic bombs were dropped on Hiroshima and Nagasaki in Japan–from early August to mid-November–the landscape of the”thirty-six hour war” in an article about appearing in Life magazine weeks after the carefully prepared lengthy report that General Henry Harley “Hap” Arnold, Chief of the Army Air Forces in World War II presented to the U.S. Department of War on November 12, 1945, when he saw a future nuclear strike against the United States as so inevitable to immediately demand a race to better-preparedness in the attempt to both monitor for their arrival with an expansion of radar stations and indeed also to develop defensive rockets that might be able to strike them as they arc toward the United States in ways our intelligence agencies must be prepared to detect. The image triggered the issue already on the front burner of many Americans in the wake of the terrible destruction of Japanese cities by atomic bombs. As if to invite readers to acknowledge that it can happen here, Life described the launching of missiles an unprecedented “1,800 miles up and some 8,000 miles around the earth from equatorial Africa”–tactfully omitting the country of origin from which the missiles were fired, but raising fears of an airborne flight so swift to allow little time for response even if the scope of the destroyed landscape of the United States was largely left to the imagination, the specter of the launching of arcing strikes of missiles whose warheads descended to an increasingly vulnerable United States–shown from over the Pacific Ocean, as if from outer space–and as a part of the future military landscape which all Americans would have to confront. The sense of inevitability of the arrival of larger bombs arcing across the horizon into American territory was a story that was launched after World War II. Rather than suggest the danger of such strikes, however, the cartography of fear was given an odd narratological counterweight, as it moved to an optimistic conclusion, despite the deep grays of the panoramic image, of victory in an age of atomic war. Without explicitly acknowledging the deep feelings of guilt at the destruction of Japanese cities in which over 100,000 were killed, it maps the dangers of a missile strike across the sea that suggested the increasing vulnerability of the country to new weaponry, and the potential combination of a V-2 rocket and atomic warhead. Despite impossibility of creating a positive narrative about nuclear strikes–and despite acknowledging the unprecedented scale of the massive destruction which it would bring–the inconclusive message advocated the weapons needed to reach victory in the war which might arrive. The terrifying image of “The Atom Bombs Descend on the U.S.” that began a “catastrophe of the next great conflict” were a consequence of the dropping of the atomic bomb that Arnold argued was unnecessary to win the war without invading Japan. The narrative of surviving such a war overcame a fear important if impossible to process, raising the fears that Hiroshima would have provoked in the U.S., rendered oddly as if it were an island, comparable to Japan, and vulnerable to arial bombing attack–as the new and unsuspected theater of atomic war, in ways that led many to depict a landscape reserved for science fiction as suddenly being an actuality. The landscape of atomic bombardment under starlit skies haunted the nation, and the assessment in the Trump administration of the increasing abilities of North Korea to attain intercontinental range in its nuclear program– before Kim Jong Un’s threat of a “nuclear strike to the heart of the US” in late July, 2017. As Arnold’s Report argued “airborne troops have become one of the most effective units of a modern fighting force,” the unsigned article imagined that radar detected the arrival of bombs, allowing a counter-attack–“real security against atomic weapons in the visible future will rest on our ability to take immediate offensive action with overwhelming force,” the report argued. And the article shifted from such an apocalyptic narrative to how that war might be successfully waged, as the detection of enemy rockets by radar systems plotted the course and positions and, in the thirty minutes available to prepare for attack, launch defensive rockets that intercept the atomic explosives–“an effective means of defense,” as Arnold had argued and Life’s illustrator tried to convey. Arnold felt it only a matter of time we develop something similar to German V-2 rockets, able to strike with precision “but armed with atomic explosives,” central to the hope of survival–and victory–in an era of atomic attack. 7. The article placed in Life moreover provided a powerful visual narrative for his appeal, creating a scenario for how such powerful defenses could defuse the existential danger of the threat of nuclear arms, echoing a myth of a winnable nuclear war promoted by later Presidents.–but with roots in the months after the dropping of the atomic bomb at Hiroshima and Nagasaki. 8. A decade before ICBM’s entered the plans of the U.S. Department of Defense, if only five years before such missiles were tested in the Air Force, the Arnold Report conjured the notion of a defensive anti-missile missile, which might destroy the arriving projectile by kinetic energy. The interest in such missiles was however immediately sparked in the post-war era by the V-2 rockets Wernher von Braun developed to bombard London, the image of an intercontinental strike on America seemed suddenly concrete. Arnold’s report occasioned a widely-circulated set of maps in Life magazine, warning in haunting grey-drenched images of missiles arriving over American cities, where the sort of total defeat that was visited on the Japanese was depicted as a possible survival. As nuclear warheads arc above unseen populations as they sleep, in the above rendering of a feared first strike, the arrival of bombs is terrifyingly removed from human agency, launched from beyond the horizon. Alexander Leydenfrost, the skilled Hungarian émigré draftsman who served as the magazine’s premier artist, rendered how such an attack might be resisted, and indeed victory be won–with the development of a large system of underground silos able to fire missiles back against the enemy whose lands might be later recaptured by airmen, in a future war waged largely from the skies. The image accompanied a narrative inviting readers to imagine the rapid pace and unprecedented destructive scale of nuclear war which so deeply tapped unspoken concerns of the nation’s future survival to lock in a logic of an atomic war. Would military officers successfully attempt to convince President Trump of the need to not launch a first strike attack? or would they even have the ability to forestall the fear of a strike that would respond to the perceived threat of US military bases in Guam or elsewhere as creating a national threat? The very definition, so often repeated by the acting Secretary of State, an individual with few experience negotiating confrontations, of what is an “imminent” threat seems to punt; it raises the question of what “imminent” means, or in whose lies the immanence of the threat actually lies, or what the line would be, save the detection of a nuclear strike. But the belief that Trump can contain North Korea’s anger at the coordinated military exercises conducted along its border, and force the country to back down from the testing of missiles which he sees as so central to his power to broker future relations with the United states, seems misplaced, as his Trump’s apparent impression that Kim Jong Un is only engaging in his own form of saber-rattling, and needs to threaten the unthinkable notion of a preemptive military strike of the sort that Cold Warriors so often discussed. The dangerous situation is, after all, a terrifying mirroring of Trump’s own plans for bolstering the military nuclear forces of the United States–so much that it might almost offer a stage prop for Trump’s own demands for military spending. We know that the President is particularly intent on asking for sharp increases in military spending for future years, cutting some tens of billions from the Environmental Protection Agency and State Department, and was eager to boast that his“first order as President was to renovate and modernize [America’s] nuclear arsenal” to make it “far stronger and more powerful than ever”–even if this claim won’t have materialized until the end of the year, the claim that he tweeted shortly after making the comment on “fire and fury”: and although the presidential memorandum issued shortly after his inauguration that called for a Nuclear Posture Review “to ensure that the United States nuclear deterrent is modern, robust, flexible, resilient, ready, and appropriately tailored to deter 21st-century threats and reassure our allies” was not unexpected, and suggests a modernization process already underway under his predecessor, Trump’s eagerness to be able to stake claims–if questionable in accuracy–to a program that is anticipated to cost $400 billion over the next 10 years, if not $1 trillion over 30 years, may lead him to ratchet up fears of a need to prepare for building nuclear arms, or to rehabilitate an old spatial imaginary designed to grow the military budget. When an earlier American general, General “Hap” Arnold, who helped drop the atomic bombs on Japan, sought to increase the military budget, such an imaginary was first manufactured as an imminent crisis needing urgent attention. In the service of such a landscape, it is useful to see Alexander Leydenfrost’s elegant two-page spread of a feared attack, made to accompany an article summarizing Gen. Arnold’s recommendations to the US Department of War about future air wars. “Hap” Arnold, who would work at the Cold War think tank the Rand Corporation, believed the expansion of nuclear weapons in airborne war as a crucial matter of import for the Secretary of War. Rather than view the terrible nature of war from the air–think of Picasso’s 1937 Guernica and the tragedy of its tortured bodies–the advance of foreign rockets is a problem to be confronted, without people; and the map of the atom bombs descending on the United States in “Thirty-Six Hour War” ask us simply to confront the question of what the nature of the war will be and how it can be best waged and won for a wide audience, affirming “we should devise every possible active defense against an atomic bomb attack,” lest the image of “a great shower of enemy rockets falling on thirteen key U.S. cities” armed with atomic bombs not be withstood. While these may not have been Arnold’s words, his own experience in organizing the firebombing of Japan and of the escalation of the tonnage used in the bombing effort in the Pacific left him convinced of the relation between powerful atomic bombs to national security. As we start to recognize the landscape and the names of cities destroyed, we are nevertheless pushed away from what is the terror of the “ghastliest of all wars“–all of which are erased by a legend warning this may be “the U.S. as it might appear a very few years from now.” Yet in this odd narrative, even through the baptism of fire, we must steel ourselves for the inevitability of a landscape in which the United States might survive, even after “San Francisco’s Market Street, Chicago’s Michigan Avenue, and New York’s Fifth Avenue are merely lanes through the debris.” The assurances in the article, taken from Arnold’s Report, that American rockets could nonetheless “lay waste” to the enemy cities, allowing airborne American soldiers to take the enemy country and claim a very pyrrhic sort of victory. The empyrean remove of the rockets arriving contrast with how a fractured picture plane of Guernica of tangled bodies render the scene of utter terror or the experience and utter confusion of an airstrike on the ground that Picasso, in his first and most overtly political image, famously worked to render so strikingly in a strikingly fragmented visual field, almost a decade before the atomic bomb was used. 9. The cartography of fear that “Hap” Arnold helped instill in the nation’s mental geography has been activated once again today. Indeed, it seems that this landscape is not removed from Donald Trump’s thoughts on what is suitably Presidential. For is the surreal map that accompanied “Hap” Arnold’s prophecy of the winnable atomic war not somehow informing Donald Trump’s rather grotesque saber-rattling in response to the threat of North Korea to attack the U.S. territory of Guam with missiles with nuclear warheads? The promise that the President made threatening that North Korea “will be met with fire and fury like the world has never seen” before aggressive nuclear threats to the United States and its military bases have escalated global tensions, by evoking the landscape of arcing missiles, removed from the terror any attack might create. The terrifying possibility that the President possessed the sole ability to “authorize” nuclear weapons and launch a nuclear attack–and to determine the “advisability” of such a launch”–raises terrifying questions of the sorts of narrative in which such a strike would be included. While intended to subordinate the military to civilian control, especially in regards to nuclear arms, the compelling narrative of preemptive or first strike abilities may not be able to be stopped–even by the Secretary of Defense–and may be animated by maps of the outcomes of containment after discussion with the Joint Chiefs of Staff. The threats responded to North Korea’s achievement of a long-sought ability to place nuclear warheads on intermediate and intercontinental range ballistic missiles. While not as reliable as the sophisticated intercontinental ballistic missiles able to be immediately launched by the United States, raises alarms since it marks the only time that a nation not participating in the non-proliferation treaty, possesses nuclear arms. But Trump’s threat unhesitatingly translate the danger into a Cold War landscape, evoked in 1945, and the logic by which missiles bearing atomic explosives across a sky demanded a massive response of military power and correspondingly massive funding of new military programs. Indeed, the argument of cultivating a defense of the nation besieged by external threats suddenly seems to be part of the script of what Trump sees as if it were somehow Presidential, and fit the office of the executive. The rendering of the deadly rain of bombardment under the cover of starlit night skies is eerily prescient, and in fact predates technologies of intercontinental ballistic missiles carrying atomic warheads that it foretold. Skilled in-house illustrators like Leydenfrost, a former professor of industrial design at the Royal Joseph Technical University in Budapest, are often credited for the chilling panoramic view of arcing strikes from an unseen antagonist, “Hap” Arnold, as well as a commander of the Pacific theater of war in World War II, helped create the first propaganda training films for the US Air Force. In addition to being “the Architect of America’s Air Force,” he founded the office that helped produce some 400 propaganda films for the US Air Force during the war; the panorama of arriving enemy rockets image, which accompanied a striking realistic painting of New York destroyed by atomic bombs, was effectively propaganda for the expansion of the military budget in the post-war era of what was then the US Department of War. And in presenting what seemed a grim prospect of the future for the very end of a devastating war, but steeling the country for its inevitability, the image of a missile strike was engraved in the unconscious of the nation. Whatever the case, the cinematic staging of such an ominous image of arcing arriving intercontinental missiles landing in multiple North American cities was close the images that not only haunted the national psyche but lodged itself for future years in the mental landscape of the duck-and-cover era as an image of immanent destruction, against which counterattack–the hope of exploding impending atomic bombs in the air by a rocket–can forestall the rain of atomic bombs over what we now recognize as the United States. The idea here, which haunted the mental imaginary in the Cold war, is that the United States, even as it was poised after World War II to be the preeminent world power, could be struck down by warheads while most of its citizens are asleep, without any warning. If the continent was difficult to recognize, the article showed Washington, DC as the target of attack, as it had never been seen, below an incipient mushroom cloud. –the imagined approach of a rocket above Washington, DC stirred fears by targeting a recognizable home ground about the Washington Monument and National Mall. There is something about apocalpytic imaginaries that makes them particularly striking occasions to consider one’s mortality. The above panoramic map was printed beside an article that described a letter that “Hap” Arnold wrote as the commander of the U.S. Air Forces to the Department of Defense. It served as a call to stir up public opinion about the need to continue boosting preparedness, on the eve of Hiroshima, for the Next Big War,–a war which would demand a system of returning missiles armed with warheads. The article effectively asked in 1945 whether American cities might suffer the fate the United States had inflicted on two Japanese cities in such a historically unprecedented show of force. While not included in the Life article, Arnold the 1945 Arnold report included ta striking image of the damages air strikes that seems to contemplate the extent of damages already inflicted on Japan before the atomic bomb was dropped–and echoed Arnold’s doubts about its necessity. As if to make the point, Arnold had mapped the damage B-29 bombers fire-bombing of Japan had inflicted on cities sized relative to American cities, listing the percentage “burned out by B-29 incendiary attacks” next to a “U.S. city of approximately the same size,” to invite readers to consider the impact of a landscape of firebombed cities in the United States’ industrial infrastructure–and to process what could have happened had an enemy nation invaded the U.S. even without the bomb. 11. While the illustrator who signed the apocalyptic panorama is credited with their truly cinematic effect, Arnold’s own acquaintance with cinematic scenarios may be revealed familiarity with storyboards and scenario. He would have gained close familiarity with military propaganda when planning the First Motion Picture Unit of the U.S. Army Air Forces, when he tried from 1942 to persuade Warner Bros. producers and screenwriters to create war propaganda films for the U.S. Air Force–resulting in “Winning Your Wings,” a recruitment film for the Air Force starring Jimmy Stewart–which glorified the future of war combat in the air and the ease of enlisting as a pilot, but minimized any potential personal or individual sacrifice. –to the post-bombing destruction of New York at the rubble of the Public Library. If the magazine was known for its images, the scenes forced readers to process the risk of future nuclear strikes more compellingly than words alone. Images dominated the issued of late November, 1945: appearing after prefatory advertisements, “The Thirty-Six Hour War–Arnold Report Hints at the Catastrophe of the Next Great Conflict” made explicit the greatest fears on everyone’s mind, starting from “The Atom Bombs Descend on U.S.” The images increased the urgency of Arnold’s 1945 Report in ways that mirror the threats of nuclear reprisal Donald Trump has recently made, startling much of the world as well as South Korea and Japan–as well as North Korea itself–in response to the firing of what was clearly an intercontinental ballistic missile in early July. The image that Arnold created of a lack of readiness is a haunting image of the first fears of the inevitable nature of future nuclear attack. The Life article sought to reach a mass audience of readers to create pressure about the request to continue to grow the post-war military budget. It is striking that Arnold’s article was accompanied by an image designed by another Life illustrator conjuring an underground facility dedicated to manufacturing, storing, loading and firing ICBM’s that did not yet exist, an underground city not able to be attacked from which retaliatory missile strikes could be fired through hidden “firing tubes” that could readily respond to the enemy in an hour. The scary article invited readers to visualize a coming nuclear apocalypse raised the possibility of a missile defense system, while allowing that “our defensive machines stop few attackers,” and advocating the expansion of a retaliatory strike mechanism as the best possible defense. –quickly gave new currency to the mapping the fears of exposing the nation to missile strikes, activating a mental imaginary not tapped since the early 1960s–and compared by members of the Trump administration openly to the Cuban Missile Crisis, undoubtedly for added immediacy and rhetorical effect. 12. Is the current geographical imagining of a nuclear response to such a nuclear threat by a counter-attack not only hopelessly out of date, but oblivious to the actual dynamics of tensions on the Korean peninsula? The recent mapping of the sudden and sizable growth of missiles from North Korea that can be classified as of intercontinental range from March 2017 raise a similar alarm. The firing in May of the Hwasong-12, or KN-17, which broke all previous records for the distance at which North Korea had fired missiles suddenly reactivated such a landscape of first nuclear strikes. For the course of its flight, which rose some 3,000 km before falling into the Sea of Japan, when leveled out suggested the attainment of a striking range able to reach even beyond the U.S. army base in Guam–and it was followed by two subsequent missile launches in July of startlingly greater range. The apparent range of the Hwasong-14 on July 17 may have revealed an ability to strike Alaska, possibly Denver, or even Chicago–attaining an ability to target cities in the United States and North America–even though it is far from clear that the missile would survive the trip. Recent news maps take care to list the names of places where American military personnel could be struck by North Korean missiles, to concretize fears of the cities that North Korean missiles of greater range might attack. The maps posed questions of first strike capabilities without any consideration of the local dynamics of power on the Korean peninsula. Even in an age of web-mapping and data visualizations, the rehabilitation of classic cartographic projections have been used to situate North Korea at the center of a theater of conflict. The employment of an azimuthal equidistant projection–a useful strategy to be able to show each point in the world lies in a uniform scale from North Korean missile bases, if in ways that its Renaissance pioneers, Gerard Mercator or Guillaume Postel, would hardly recognize. For the azimuthal projection serves to activate fears of future nuclear strikes by rendering North Korea at its center in bright red–and process the fears of what a first strike would entail, and indeed to globalize what is in fact a confrontation between the United States and North Korea–and a response to the sense of vulnerability that the North Korean government has to joint military exercises near its shore. The projection helps to map North Korea as a prime global threat, however, as if to mirror the responses it had provoked from Donald Trump, and its place at the center of global media attention, isolating the country that has tested increasingly powerful ballistic missiles from May to July as an absolute and undeniable danger for the entire world. The map helps process the emergence of North Korea a hot-button issue, to be sure, but also removed it from networks of local knowledge or diplomacy, identifying it with the color associated with danger signs to map the newly expanded striking capacities of its missiles as a focus of global concern in no uncertain terms. The arrival of a projection centered on North Korea suggests not only a shift in perspective on geopolitics in the post-Cold War world. It foreground a new threat tied to nuclear proliferation: North Korea has been recognized as able to produce compact missile-mountable nuclear weapons with rapidity and the fear that North Korea is able to deliver a nuclear warhead to the United States–and that North Korea has enough a fissile material stockpile sufficient for 60 bombs today to produce additional fissile material at a rate of 12 bombs per year–meant that it would even have the chance or possibility of exploding warheads over multiple American cities, even if the July launch of a Hwasong-14 that shot up to a height of 3,700 km didn’t demonstrate successful atmospheric re-entry on which the delivery of a nuclear warhead would depend, although North Korea claimed it suffered no structural damage during its July 4 test; but the test suggested that the new North Korean missile was able to travel the 5,500 km to qualify as a truly “intercontinental” ballistic missile the country had ever constructed. But the geographical imaginary of the Cold War is not able to be so seamlessly translated to the Korean peninsula, where the “arms race” that seems to have developed as the result of the buying of warheads and technological expertise suddenly available on the black market, and perhaps from a missile plant in Ukraine, from a factory from which Russia had canceled their order to upgrade their own fleet of nuclear warheads, and from which North Korea tried to purchase “missile systems, liquid-propellant engines, spacecraft and missile fuel supply systems” a year earlier, according to United Nations investigators, much as memos from the Obama administration released by WikiLeaks described North Korea using missile designs used in Soviet-era thermonuclear warheads. Maps are good to think by, and important tools to process such striking and difficult to digest information about a shift in power reand global threat. But if maps are what we use to think about conflicts, although the technology transfer of Russian-designed missile engines to North Korea may have come from missiles languishing in Russian warehouses, the translation of a geographic imaginary from the Cold War North Korea’s use of the missiles makes little sense: the confrontation about increasing ICBM potentials able to strike the U.S., about which rumors circulated in 2009, and for which bomb testing began from 2013, is poorly mapped as a confrontation only between two adversarial nations, but complexly enmeshed in the tensions and politics of the Korean peninsula,–and not successfully visualized as from an adversarial unseen enemy lurking over the horizon, and threatening to strike cities in the United States, as in the terrifying panorama rendering “Hap” Arnold’s dark view of the future of warfare. Alarmingly, if the global relations of Pyongyang to the inhabited world were shown in ways that better accommodated imagined arcs of ICBM’s along its surface, the global reach into North America, so long desired by North Korea, can be alarmingly shown in ways that suggest the expanding reach of North Korea to cities in the midwest and east coast, assuming the missile’s standard trajectory to crest above 10,000 km, and, given the eastward extension of this range by the planetary rotation of the Earth, allowing an even greater range depending on their direction, perhaps placing New York and Boston within striking ability of North Korea, if leaving Washington, D.C lying just barely beyond range. 13. Maps demonstrating the “growing reach” of North Korean nuclear warheads have been widely peeled and showcased in multiple media outlets in recent months, as the firing of ballistic missiles launched on rockets has brought renewed speculation on just how far the ability of Pyongyang to target cities in North America is–raising questions that indeed echo “Hap” Arnold’s own concerns, and seem closely tied to support for renegotiating the military budget in the Trump administration. The maps that visualize the growth of North Korea’s striking range displayed in the news are, after all, far from disinterested, and often seem designed to alarm. But is the mid-August map an “imminent” threat? Or is it only a public taunt? The North Korean media certainly staged this photographic opportunity as a means of shifting power from Washington D.C. to Pyongyang, where generals using pointers indicate the missile strikes they might now achieve. The notion of “imminent” threats, an opaque language first used by U.S. Secretary of State Rex Tillerson, suggests the start of a new post-Cold War world–or at least recuperates the threat tied to lobbying for new military budgets that “Hap” Arnold advocated. How this notion of “imminent threats”–although the quite chastening threat North Korea’s Foreign Minister Ri Yong Po made to the press, and to the United States, that “Should the US pounce upon the DPRK with military force at last, the DPRK is ready to teach the US a severe lesson with its strategic nuclear force,” indicates eagerness to stage nuclear strikes for defensive ends–the compromising of the Department of State having hampered possibilities of skillful negotiation or fruitful talks. But the arcing nature of missile strikes, not able to be clearly communicated in Google Maps, and the considerable liabilities of web-Mercator, or pseudo-Mercator, has also led to a resurgence even in the age of web-based mapping of the globe to render the fears of such strikes more credibly communicated–at least to understand them as the existential threats they truly are. Fears of first strikes were long contained by arms control negotiation and nuclear arms bans, but the resurgance of the nightmarish image that can be traced by to “Hap” Arnold has led to a SALT talks temporarily froze numbers of ICBM’s that were held by Russia and the United States from 1970, trying to hit a “reset” long before Hillary Clinton presented a “reset button”–although weapons designers and manufacturers managed to circumvent the treaties’ stipulations, and helped Ronald Reagan run on the platform to “rearm America”–as if strategic arms negotiations had hindered military modernization. Reagan soon introduced futuristic speculation about building a missile defense shield, however: “What if free people could live secure in the knowledge that their security did not rest upon the threat of instant U.S. retaliation to deter a Soviet attack, that we could intercept and destroy strategic ballistic missiles before they reached our own soil or that of our allies?” Reagan asked the nation, as if to accommodate the threat of intermediate range missiles, in ways that evoke the very solution that “Hap” Arnold had provided. While the notion of a space-born system including particle beams and “battle mirrors” and ground-based lasers removed the question of nuclear conflict from the earth, with the promise of destroying nuclear warheads as they soared far above the stratosphere, and before re-entering the earth’s atmosphere, and non-nuclear deterrence seemed to merit the name Star Wars in 1983, if the use of surveillance satellites is eery, mapping the eventuality of such a ballistic missile strike more terrifyingly acknowledged its fear as all to real, and depended on the accuracy of interception far above the earth–hopefully above a place like Greenland, which seemed pretty well removed from most inhabitants, but recuperated and modernized many of “Hap” Arnold’s ideas–but offering a system for the destruction of incoming missiles by lasers or x-rays that was particularly dear to Edward Teller and Ronald Reagan..
14. North Korea’s plans to expand its ballistic missile arsenal from June, 2017 provoked similar considerations of just how far such strikes could extend and what cities they could strike: maps are presented as the way of defining something of a red line of aggression, even if the nature of these strikes is totally hypothetical, and the precision of the missile strikes may be totally off. Despite the apparently unbalanced desire Kim Jong Un voiced to reduce the United states “to ashes” by “invincible Hwasong rockets tipped with nuclear warheads,” the vainglorious boast seemed to gain new levels of reality after the success of ballistic missile tests that were shot into the Sea of Japan to altitudes of above 1,300 miles, but which seemed to be able to gain far further strike capacities. Although military experts assure us that the Korean missiles currently developed could strike targets as far as New York, but the precision of these strikes cannot be guaranteed. But the accuracy of the genre of mapping seems to presume that the accuracy of strikes against cities is most likely. And even if the accuracy of North Korean ballistic missiles can’t be ascertained–and the embarrassment of a strike that fell in the ocean or in the desert demanded to be avoided, even if the threat to target Guam is all too real for many, after North Korea promised to fire missiles into the waters surrounding the island at a distance of just fifteen miles from the shore–a threat that echoes the charge that Kim Jong Un gave his military to develop arms capable of striking Guam and Hawaii, as well as the continental U.S. (The dryly worded fliers offering emergency tips about surviving a nuclear strike from North Korea published and distributed by the Department of Homeland Security caution against looking directly at the flash or fireball and not wearing conditioner after the strike as it might bind radioactive elements to one’s hair–although showering off is recommended to remove contamination–although the fourteen minutes that residents would have to prepare for an actual attack wouldn’t give one much room to take cover or protect loved ones.) What the official readiness website advocated as the most important mode of preparation–to be as far from the site of attack as possible, according to Ready.gov, of course seems by far the most unattainable. –as the increased range of intercontinental ballistic missiles of over 7.000 miles suddenly seems to put cities like New York, Washington DC, and Chicago within striking range. Although it may be more terrifying that cities in Japan like Tokyo are most directly in range of the common Taepodong-1 missiles, the notion of American cities lying within striking range has been taken as the most bellicose action–in large part because it can be mapped, even if the intersection of such a map of capacities with the bellicose rhetoric of the newly “elected” American President more of a concern than the maps Kim studies. What provocation he finds in them may have little actual check among Generals or officials in the Department of Defense. Rather than being based on an actual launching of an act of aggression, the promise of the American president to met any military action will be “met with fire and fury” used apocalyptic rhetoric of biblical proportions to suggest a deep panic over the inability to contain North Korea’s nuclear capacities–although the departure of North Korea from the Nuclear Non-Proliferation Treaty in 2003, during the Bush Presidency, was something of a ticking bomb, as it led to accelerated nuclear weapons development. As much as throw a familiar alliteration of mass destruction to Trump’s base in the fundamentalist right, North Korea was given a jump start when Trump used America First bombast to urge nuclear programs be developed in Japan and South Korea, and that the Unite States would no longer station troops in bases in both of North Korea’s neighbors. The specter of a proliferation of warheads close to North Korean shores must have triggered a deep-set fear in Pyongyang of the need to ramp up their own defenses, following the same sort of logic that “Hap” Arnold long ago advocated, shortly after he had moved the bomber force of B-29 planes that became the Twentieth Air Force to Guam? Actor Ronald Reagan would probably have best known Arnold for his role in creating the First Motion Picture Unit which produced over 400 war propaganda films after 1942, including The Last Bomb, about the payloads that B-29s delivered over Japan–a film which began in Guam and which concluded in operatic fashion with the mushroom coud over Hiroshima explosion, as a reassuring voice-over reminds viewers at its close saved hundreds of American lives. If Reagan starred in many of the films the the FMPU produced, a young Donald Trump would likely have been impressed with the cinematic standard such films set for mass destruction by guided missiles, or provided the basis for the level of destruction that the world had, indeed, seen–if only on a screen. The mapping of missile ranges are removed from any broader military context of troop movements in the declarative statements of the missile ranges that North Korea has been able to achieve, as if to place the entire story within its shores. 15. The eventuality of such an expanded ballistic missile program has, quite surreally, led the country to issue a new series of commemorative postal stamps that proclaimed its arrival on a world stage of ballistic missiles, which North Korea has done its best to promote in order too suggest the range of its missiles–most notably in a stamp, pictured below at right, that makes a clear visual case that it would be no problem to fire a missile into any site in North America, by juxtaposing its launching from the red peninsula of North Korea into the North American heartland–or at least suggesting that North America lies increasingly within striking distance. (Inflammatory rhetoric of North Korea that the country was studying plans to according to state media.to create wall of “enveloping fire” about the island has helped ramp up the hysteria of the United States.) The philatelic celebration of the benefits of dedicating so much of the defense budget of a poor country to the development of nuclear warheads and ICBM’s suggest that the goal of striking the once-elusive continent of North America is finally in reach. North Korea proudly claimed that all of the mainland United States was “within striking range of the DPRK missiles” with considerable satisfaction, as if to mark the arrival of the country on the global stage, and, as if in response, terrified news organizations imagined the results of this increased striking range of long-range missiles in global projections. Exploiting the elegance of a shifting projection, North Korea suddenly was placed at their centers, as if to confirm a narrative proclaiming North Korea’s new image of itself as a nuclear power: maps alarmingly showed North Korean missiles like the Hwasong-12 gaining a striking range beyond 3,700 km; maps reflected the estimated expansion of the radius of potential missile strikes in an azimuthal equidistant projection centered on North Korea, in order to better render the danger of North Korea’s development of Intercontinental Ballistic Missiles–or ICBM’s–to carry missle-ready nuclear weapons. –the grant immediate concreteness through the inclusion of specific place names, allowing us to envision the very white-hot arcs that “Hap” Arnold helped us to imagine. The range of individual North Korean ballistic missiles’ respective ranges provides the most effective way to describe the abilities of their arsenal, but the most accurate mode of assessment may be to specify the ranges of specific missiles. However, the ranges of missiles in question does not seem to be nearly so stable as a map might suggest: the estimated range might vary by over a thousand kilometers. 16. While the panorama that “Hap” Arnold may have imagined inaugurated the landscape of atomic fear now known as the Cold War, the resurgence of fears for visualizing the new nuclear landscape strikingly omits any sense of the effects of such bombs’ explosions, and only pauses to indicate the range at which such strikes may occur. The imperative to view the actual implications of what such strikes might bring has led increasing numbers of users to visualize the destruction of cities in historian Alex Wellerstein’s Nukemap. The website immediately attracted after its 2012 launch thousands to detonate bombs of varying payloads over cities worldwide after visiting the website–after thousands used it soon after it was first posted in 2012, the site has become astoundingly popular as a platform to allow visitors to stage over a hundred million virtual detonations of nuclear bombs since its launch. In the website that invites viewers and users to consider the impact on actual targets of the bombs–an aspect that is handily omitted in most maps of the range of North Korean missiles, though one would not have wanted it any other way, the effective but rather flat Google Maps API provides a salutarily chastening platform for viewing the potential scale and devastation created by such mass destruction and even for quantifying its human losses likely to occur, if only to remind us of the unthinkability of starting a nuclear war. And although the rhetoric of the North Korean state-run media undoubtedly escalated matters when it cautioned in an item intended for domestic consumption, that the United States “will sink into an unimaginable sea of fire on the day when it dares to touch our country by stupidly causing mischief and brandishing its nuclear and sanctions clubs,” the improvised if ill-considered response it provoked about “fire and fury” suggested a willful avoidance or ignorance of human lives that would be the consequence of such devastating attacks. The detonations that can be placed in any neighborhood mapped on Google Maps offers a chastening if increasingly popular exercise of imagining the erasure of one’s home town, or its rival. The image may offer a fearless preparation for the inevitable–as if a modern memento mori or an Art of Dying–whose comfort created far greater popularity than its designer, Alex Wellerstein, had predicted. The apparent objectivity of its option to “detonate” a bomb of different payloads seems a video game of its own, although one without much action–and whose own apocalyptic narrative has a pretty abrupt conclusion. (Wellerstein devoted an great post, to which I’m indebted, on his Restricted Data blog about the 1945 Life panorama of nuclear destruction, which conjured a graphic rendering of Arnold’s report as Commanding General of the Air Forces. After the Washington Post called his 2013 Nukemap website a “sign of our jittery times,” Wellserstein rightly observed that visualizing nuclear apocalypse has actually been an “old media pastime”–existing at least from the time that the first atom bomb was dropped.) The platform Wellerstein cto visualize the implications of the aftermath of a nuclear strike should give one pause–for they are far more honest than visualizations that privilege the incursion into our local airspace or sovereign space. The ready mapping let one map the consequences of a nuclear strike on any browser that supports the Google Maps API, effectively dropping Fat Man-style bombs or H-bombs or the largest fission bomb in the United States’ arsenal or bombs from the Russian battery of nuclear warheads on the city of your choice in a “nuclear effects calculator” of the intensity of the airburst and fireball, rem exposure, major overpressure, number of fatalities and injuries–as well as radioactive fallout, across bombs of different yields on any place in the earth that is mapped by Google Maps–allowing us to come to terms with destruction of different levels in different centers of population, imagining that any city anywhere may be indeed subject to a nuclear strike of a significant payload. The notion of mapping your own apocalypse in ways that are pretty conclusive may have been designed as a cautionary and chilling website, but a few years after it has made the rounds online has perhaps ramped up hysteria about a foreign ballistic strike. 17. All this seems startlingly concrete once again in the age of Trump. In rightful response to the fears of the greater range of missiles from Pyongyang, one cannot tell if the current American President would want to test the actual accuracy of North Korea’s new ballistic missiles. But the sort of saber-rattling in which Trump has indulged seems designed to promote the growth of the military budget in allegedly exceptional circumstances in ways that echo “Hap” Arnold’s project of inviting us to envision strikes that would bring nuclear disaster. The heights of missiles fired from May to July suggest strikes that would not offer much of a response from US interceptors in Guam, or Alaska, as their trajectories their engines allowed would only permit targeting at low altitudes. The missiles would, in other words, in deeply frustrating ways, evade the massive military presence of the United States in South Korea and Japan given their high altitude. The missiles, however, in an attempt to shift public discussion and concern from the issues of racism, hate-filled language, and homegrown violence that seem to be most central on our national plate–or from the inquiry into coordination with foreign actors or governments to tilt the results of the 2016 Presidential election. Perhaps Trump merely wants to create a media sensation and rush of endorphins that seem designed to obstruct any inquiry into his administration’s ties to foreign governments or distract from legal inquiry into its potential crimes. The mental imaginaries of destruction that the maps of the newly increased range of North Korea’s missile set off alarms, however, and compelled Guam’s Homeland Security office–the local branch of DHS–to issue a “Guidance entitled “Preparing for an Imminent Threat”–using the same term adopted by Rex Tillerson as if to acknowledge the arrival of an occasion of imminence of an explosion that would release enough radiation to compel islanders to locate windowless shelters with thick concrete walls “dense enough to absorb radiation” that the nuclear warheads would release. 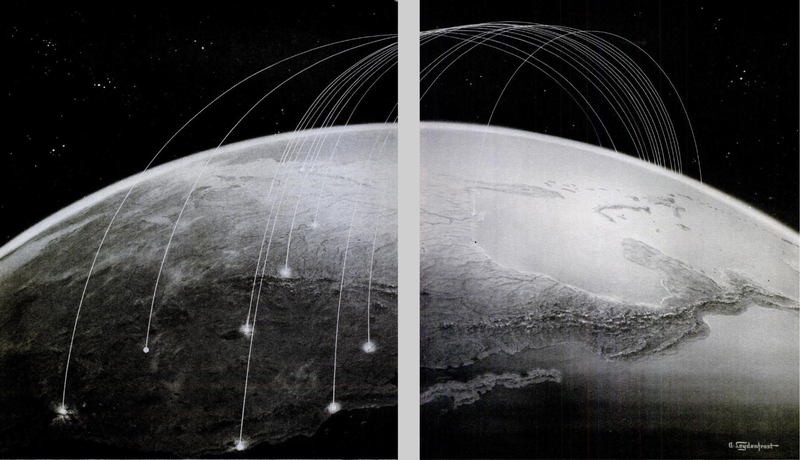 The genealogy of images of unmarked missiles arcing over inter-continental space is not that submerged a current in American history but has a genealogy that might be forgotten, but parallels the swings in the pendulum of increased requests for a military budget. The transmission of this political demonology is less targeted against demons that are located within the country, to be sure, but the threats to security that arrive from afar are rooted in a language of the future in order to justify the expanding horizon of military expenditures against an unknown menace. If the demonology is less directed toward internal subversives, it is of a piece with “Hap” Arnold’s conjuring of a nightmarish landscape of impending clouds of war, and demonizes subversives who don’t recognize or distract from the war effort. As much as serving to demonize a cultural “other”, the “first strike” landscape of intercontinental arcing missiles paints an indelible picture of ongoing existential threats from the outside, with the ends of magnifying fears of an unknown other, who is seen as a threat to the world. Continuing to evoke the specter of nuclear strikes has served to stage false claims of patriotism in particularly effective–if dangerous ways–in recent American history over several generations. But the false patriotism reflexively instilled by invoking nuclear attacks in public media is, strikingly, no longer particularly American, but broadly diffused as the same sort of false patriotism has been widely imitated: it has now globalized, and is not easily exorcized, in large part because it both seems and is particularly real. We demand maps to process the expanding threats of ballistic missiles, but their threats are all too easily summoned to discount diplomacy, ignore negotiation, and naturalize a global threat of nuclear Armageddon–as a threat that merits dangerously confrontational rhetoric–although rhetoric that demonizes the threats to global and national security only serves to exacerbate actual global conflicts, imperil the world, and do so with potentially catastrophic consequences.